The Brainstorm & Research tool of the SBI! Manager is soooo valuable. It brainstorms the Web and researches your theme to develop your Web site's "Perfect Keywords." 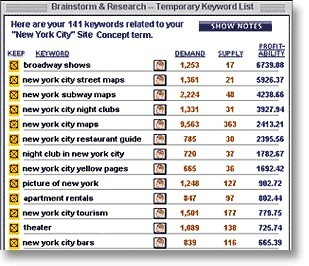 It will tell you what the "Demand" -- the number of people searching for each keyword in a particular month... The "Supply" -- the number of sites that supply that particular keyword... The "Profitability" -- the higher the profitability number the better... AND, it also comes back with website URL's related to the particular keyword. Potential Affiliates!! !